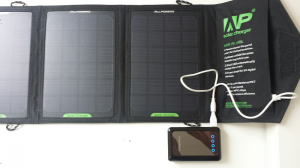 Since quite a few weeks I only charge my smartphone powered by solar power. I’m a bit skeptical that it works for the 51° latitude in the middle of Europe across autumn and winter. Until now it all worked fine even if the charge process took a while. I’m using a power pack that can power and simultaneously charge. To start the charging process you have to push a button. As soon as the device is fully charged the power pack shuts down automatically. My real goal is to power a Raspberry Pi independent from the power grid outside 24/7/365. At the current stage I just analyze the output from the solar panel under different conditions. The test phase will continue over the winter month until the second quarter of 2015. With the current knowledge, I can’t use any of the components as the solar panel is not powerful enough and the power pack requires manual interaction. The good news is there are there are plenty of solutions available, like the one from Adafruit.